2007/2008: DelDOT converted from the “Delaware Special” bike warning/Share The Road (STR) sign, which included the STR wording above and below a small bike symbol, all on one yellow diamond sign, to the federally recognized bike warning sign (no words on diamond) with supplemental STR rectangular plaque under the diamond sign. There was no effort to universally change the old to new signs all at one time. DelDOT has changed out and will continue to change out the old signs as they are impacted by projects, are knocked down, or as they reach their service life. So you may still see some of the old signs in the field. It was also during this time frame that DelDOT began limiting the usage of the sign + plaque to roadways that had no or narrow shoulders. Summer 2011, Delaware officially adopted the Delaware Manual of Uniform Transportation Control Devices (DE MUTCD), which is in substantial conformance with the 2009 federal MUTCD. 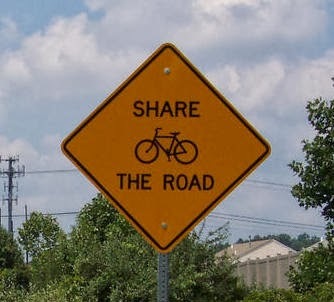 The 2011 DE MUTCD included the STR plaque and specific guidance that the sign + plaque should only be used on roadways with no shoulder or a shoulder less than 4’ wide. Between 2011 and 2013, comments began to surface from various bicycle advocates complaining about the STR plaque. As DelDOT had just adopted the 2011 MUTCD, which included public input, the agency did not want to make additional changes at that time. 7/17/13: DelDOT Traffic and Planning met with several Delaware bicycling advocates regarding the list of biking issues compiled by the Delaware Bicycle Council. Most of this meeting was spent going through the list and discussing possible short-term upgrades such as signing and striping. 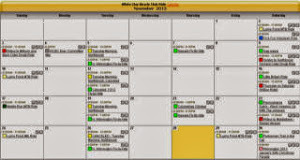 Several of the recommendations at specific locations have since been implemented and others are still in the works. One of the advocates brought the STR plaque issue up again at this meeting, as adding bike warning signs is the best DelDOT can do in the short-term in many of the locations where there are concerns. 7/17/13 - 8/9/13: Internal DelDOT discussions on the pros/cons of eliminating the STR plaque. 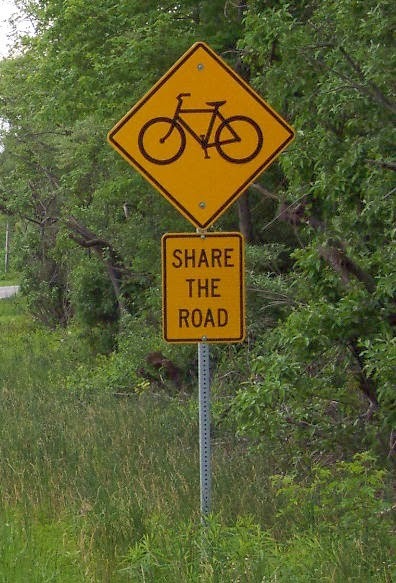 8/9/13: DelDOT emailed the known bicycling organizations and advocates known throughout the state, requesting comments on the preliminary recommendation to eliminate the STR plaque. DelDOT received some useful input on the topic. 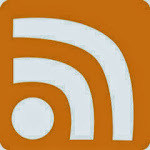 In addition, there were extensive blog postings on the Bike Delaware and the Institute of Transportation Engineers (ITE) sites (the DelDOT initiative did not start the ITE blog – it was already a topic under discussion). 9/30/13: Deadline for the submission of comments. October 2013: As there were no significant objections to the proposed elimination of the STR plaque, DelDOT's Traffic Section drafted a final memo and circulated it internally within DelDOT for comment. 11/1/13: Memo is finalized, distributed, and posted on DelDOT’s web site. 2014 and beyond: Similar to the last time the bike warning/STR sign/plaque was modified, there is no plan to go out and comprehensively remove all the STR plaques. DelDOT will bring signs up to current standards/policy as they are impacted by projects, are knocked down, and when they reach their service life. This is how most traffic control devices are upgraded to new standards. In the end, this was not a campaign led by Bike Delaware. 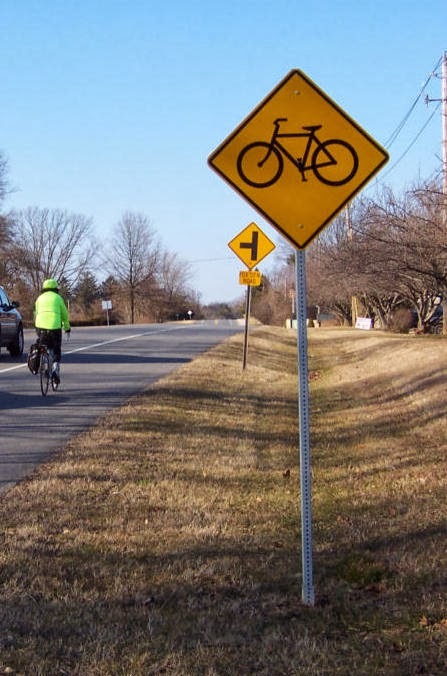 DelDOT recognized an opportunity to eliminate controversy - with reduced sign clutter - and helped Delaware bicyclists seek a resolution with the input of multiple parties. As this discussion evolved over the years - and may continue to evolve, it has become an example of the long and winding road to progress. It is worth noting that DelDOT listened to the cyclists in this state and did not wait for an active campaign on the part of bike advocates to address this topic. For this reason, it is a good example of pro-active efforts on the part of the DelDOT. We look forward to seeing more positive examples of teamwork such as this in the future.